If you really want to do something, support a constitutional amendment. So says the guy that is going to endorse the ones who support that. Why do you have to attack people who disagree with you! Do you support his Amend to get money out of politics or not.? Or you just want to attack people? It could be worse. ZenDog attacks people who agree with him. Distraction. "he hit me 1st!" "he did it, why can't I?" If the Zen master jumped off a bridge would you.? Why can't you judge you're course of action based on right & wrong, & not on what other people do? Can't you take responsibility for your own behavior instead of saying "he made me do it"
Don't you have any personal ethical compass you can depend on? I support it. Of course I support it. Money out of politics, end the banking cartel. Simple. But you cant support something and then vote for the problem, which is exactly what he's going to do. Like being for the Green Party and driving a hummer. Like many he believes that voting for 1 of the 2 parties is the best option to address our problems. He may not think voting 3rd party when that 3rd party can't win will change the money in politics situation. Why can't he vote how he wants without your offensiveness.? Why can't you treat people who disagree with you with respect.? Is your opinion the only right opinion? All others must be ridiculed? Hey, he can do whatever he likes. But all of this double talk has got to stop. We cannot have people screaming for change, and then do NOTHING week after week, only to troll to the polls once every two years and endorse the status quo. That doesnt lead to change. That leads to nothing. This guy puts a tremendous amount of leverage in voting (way too much in my opinion, see my post on voting). So if that the ultimate way of stating your opinion, how can one side with the people who are practicing what is deemed to be the main problem? Well I have been at OWS meetings with him. So I know he is doing more than engaging with the closet republicans here whose goal is only to convince progressive OWS supporters from voting. I also know from his website that he has gathered and absorbed much information. There is nothing wrong and everything right in attempting to get change/reform through workking within the system. You may not agree, that is your right. But to personally attack people who choose this path just because you disagree betrays a disrespect of individuals that is unproductive. Why can't you allow people to have their own opinions, find common ground and debate in a civil, respectful way. If you wanted you could be better. Do you think you can change someones mind with insults, & bullying? Or do you know you cannot but do it just for pleasure? There are plenty of internet studies that show people go onto political sites stricly for the mental reactions they get from arguing with people, and Im assuming I am no different. The reform vs rebuild arguement has been going on since OWS started. Both sides have a point. In reality, both sides just dont have the support to do it. If they did, which one would bring the drastic and needed change? Working within the system always seems like a decent idea, but its going to get the same results as it always does, Im guessing. So why resort to the offensive bullying? Do you think you will change someones mind? Or do you just enjoy putting people down? Best place for Occupy to Be! Get out there.. and get our voices heard! Yea! I can't wait to get out there! But where is there? And what are we protesting specifically? I mean are we protesting evil corporations that pay and give their workers benefits! Or, are we protesting Obama and his left wingers? 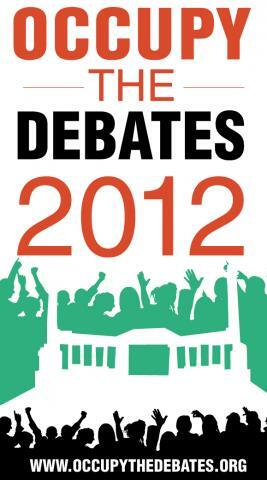 These ain't debates they are joint news conferences. It's a fraud! And they are scared to have 3rd party paricipation. Not debates but merely 'auditions' by these two phony political stooges, and the two "Vichy" political facades, to try-out as potential sell-outs, pawns, puppets, and faux-emperor/presidents of our post-democratic country run by the DGE (disguised global Empire), the corporate/financial/militarist Empire, and the global ruling-elite. Best luck and love to the fast expanding 'Occupy Empire' educational and revolutionary movement against this deceitful, guileful, disguised EMPIRE, which doesn't wear 'Red Coats' (or funny looking helmets). ok! Tell us how you really feel! Do you support a constitutional amendment to overturn Citizens United & Corporate Personhood ? Should any representative be relected who put his or her pledge to grover norquist above his or her pledge to America - and thus refused to tax the 1% ? It has been a year of extreme weather. Droughts, floods and wildfires have ravaged the US during the hottest 12-month period in our country’s history. Meanwhile, sea ice in the Arctic melted more this summer than ever before, and experts are saying that within a decade we could see ice free summers there for the first time in many thousands of years. The message is clear: global warming is real and it’s happening right now. That's why we need to hear what the two presidential candidates are planning to do about it. And there’s no better space than the presidential debates for them to do just that. Take action today and help make the issue of global warming part of the debate for President. On Wednesday of next week, President Obama and Mitt Romney will meet in Denver, CO for the first of four presidential debates. Neither major party candidate has really discussed the issue of global warming much at all so far during the campaign. Now is our opportunity to change that. But there isn’t much time. Jim Lehrer of PBS is hosting the first debate and likely compiling the questions as you read this. Send a message today to Jim Lehrer and ask them to make sure that global warming is part of the presidential debates. After all, a planet that can continue to sustain human life is an important part of any solution to any of the other problems we’re currently facing. All we’re asking for is one question. Considering what's at stake, it's not too much to ask. People - Have you taken the survey yet? Personally, I am not happy either with Obama! He dosen't care about people like us who don't have a life! Think about it! Has Obama ever donated to our low food fund? No! Then there is Romney who thinks we should go out and work for living! Why can't we have your OWS guy run! Excellent. Nice job Denver and NO. I'm going to occupy another TV channel.